We are a cozy, upscale Hair and Beauty Salon serving Hampton Park and surrounding Suburbs. We offer a very professional, comfortable and laid back atmosphere to find the right style for you, whether you are interested in a totally new creation, something for a special event or one of our other specialties such as cosmetic tattooing or hair extensions. Come and give us a try, we look forward to spoiling you. Amrita's Hair & Beauty Solutions. AHBA in conjuction with 1to1 Beauty, is now conducting Government Accredited Training: List of Courses listed below: Certificate II in Hairdressing Certificate III in Hairdressing Certificate IV in Hairdressing Diploma of Salon Management also Certificate II in Retail cosmetic Nail Technology & short courses in Waxing, etc. Austudy, Abstudy, Vet (Secondary Schools), Parents returning to work funds. Extensive training over 15 years, I beleive that Students need 88% hands on experience, to enter the workforce without any fear. That's what AHBA concentrates on our Students. Once student are trained in a specific unit, they go to the salon to work on clients. Pls call Sandra for further enquires. Enrolments every 1st day of the Month. 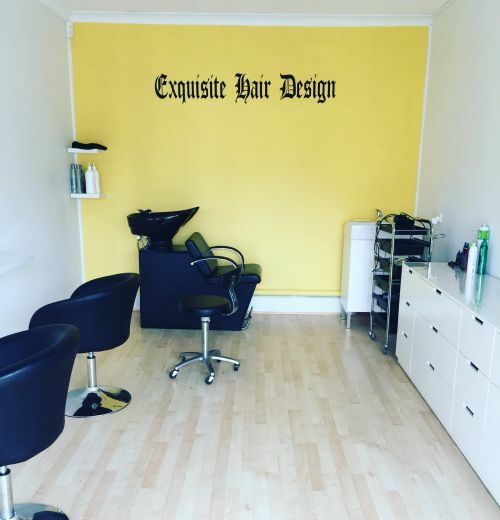 Exquisite Hair Design, a home based salon specialising in hair colouring, ladies style cuts, blow waves, mens cuts, children's cuts, hair up styles, tape in hair extensions, I-tip hair extensions and make-up for every occasion. Great deals available, including complimentary hair treatment with every colour service. like us on Facebook to keep up with offers.